What is meant by the greenhouse effect? 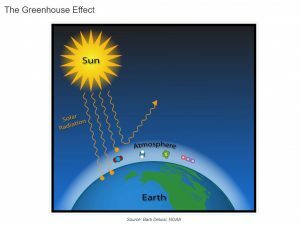 What is the greenhouse effect and how does it affect our climate? The sun is the primary source of energy here on the earth. Heat generated from the earth’s interior (geothermal heat) is estimated to be only about 0.027% of Earth’s total energy budget at the surface so can be ignored for most purposes. The earth reflects about 30% of the incoming solar radiation. The sunlight that is not reflected then passes through the atmosphere and heats the earth’s surface. The surface then re-radiates that heat (infrared radiation) back through the atmosphere. This heat is partially absorbed by greenhouse gases warming the atmosphere more than it would otherwise. Without greenhouse gases the earth’s temperature would be about 33°C (59ºF) colder than it is now, and our world would be a giant snow ball. The major greenhouse gases are carbon dioxide, water vapor, methane, and nitrous oxide. 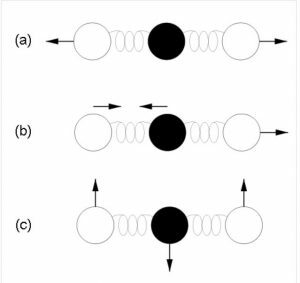 All of these molecules are made of three or more atoms which can vibrate in complex patterns when they interact with infrared photons (heat). Eventually they will release that heat, some of which escapes into space while some is radiated back down to the earth’s surface and some may be absorbed by other greenhouse gas molecules. Most of the atmosphere consists of nitrogen and oxygen, both of which are made up of two atoms that are bound together tightly and unable to vibrate so they do not act as greenhouse gases. Water vapor is a major natural greenhouse gas that responds to temperature changes. As the temperature of the atmosphere warms, the water vapor content of the atmosphere increases which creates a positive “feed-back” adding to the heat absorption created by the other greenhouse gases. This process is complicated as increasing water vapor also tends to increase the total amount of clouds. Clouds can provide either a positive or a negative feedback by trapping outgoing thermal radiation or increasing the amount of solar radiation reflected back to space, respectively. Water vapor represents around 80 percent of total greenhouse gas mass in the atmosphere and 90 percent of greenhouse gas volume. It is estimated that water vapor accounts for about 50% of Earth’s total greenhouse effect, with clouds contributing about 25%. In recent years there has been growing interest in rising global temperatures since the mid 1800’s. This recent period of global warming has been mainly attributed to the steady increase of atmospheric trace gases produced largely by human activities, such as carbon dioxide, methane, nitrous oxide, and chlorofluorocarbons (CFC or “Freon”). These gases have been accumulating over time in the atmosphere and thus are adding to the natural greenhouse effect. Over the past approximately 150 years the level of carbon dioxide, for example, has undergone a very significant increase of about 40-45 percent, which cannot be accounted for by natural sources alone. Despite the large increase in atmospheric CO2, the total amount of CO2 still comprises only a tiny 0.04% of the total atmosphere. Estimates of CO2’s contribution to the greenhouse effect vary greatly between 2% (0.7 C) to as much as 26% (8.6C) of the total 33 C greenhouse effect. 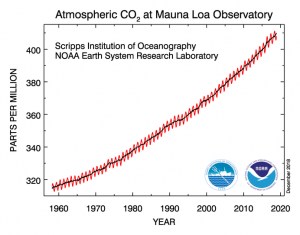 This means that there is some uncertainty as to CO2’s actual contribution. In addition, there is also uncertainty about the sensitivity of the climate to CO2. The best estimates I can find is that doubling CO2 in the atmosphere should result in a warming of 0.4 C to 1.2C before factoring in any feedbacks. As the planet gets warmer, more water vapor evaporates from the Earth’s surface adding to the total amount of water vapor in the atmosphere. As stated earlier, water vapor is the most significant greenhouse gas, so more water vapor in the atmosphere leads to even more warming. Climate feedbacks are processes that amplify or reduce the effect of a particular climate forcing and play a role in determining total climate sensitivity. Based on past glaciations, climate feedbacks could amplify the warming effect of CO2 by a factor of about 2. Model simulations suggest a wide range of estimates regarding how the doubling the CO2 levels could eventually warm plant. Estimates range from a low of 0.8 C to as much as 4.5 C with the most likely range being between 1.2 C and 1.6 C. The difficulty in estimating future temperature based on CO2 levels is that there are many other factors that come into play, including atmospheric dust from volcanic eruptions, amount of forests and other vegetation, variations in incoming sunlight, aerosol particle pollution and the relationship of the deep global ocean currents. In future posts, I will explore in more detail the various opinions on global warming or climate change and how this will effect the rate of sea level rise. 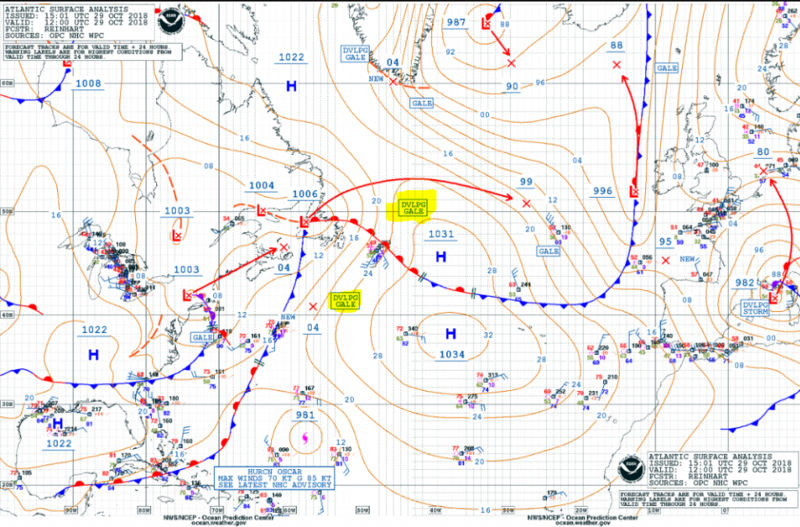 An intense 937 mb storm over the west-central North Pacific is producing winds of 60-75 knots and significant wave heights to 17 meters (about 56 feet) within 90 to 240 nm southwest of the center and within 120 nm northeast of the front north of 45 North. This system is in the main shipping lanes to/from the US West Coast and Asia and will likely cause some shipping delays. 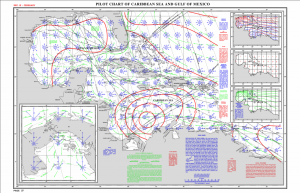 If you are planning a cruise or will be sailing during the month of February check out what weather to expect in the Gulf of Mexico and Caribbean Sea. 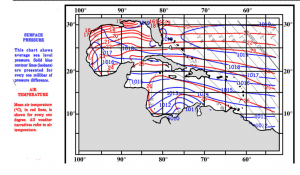 Over the Caribbean during February winds tend to be mostly from the east or northeast averaging Beaufort forces 4-5 (11-21 knots) with the lightest winds occurring over the eastern Caribbean and the strongest winds over the southwestern Caribbean off the coast of Colombia. Over the Gulf of Mexico winds tend to be more variable but still averaging mostly Beaufort forces 4-5 (11-21 knots). 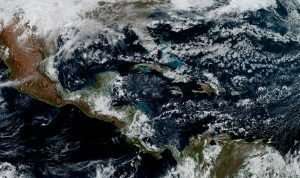 The risk for gale force or higher winds is low, generally 1 % or less, except 2% off the coast of Colombia and 2-3 % over the western-most Gulf of Mexico. Strong to near gale conditions can occur across the west-central Caribbean Sea and western Gulf of Mexico during February. The highest risk of encountering rough seas of 8 feet (2.4 meters) or more is 30-40% over the west-central Caribbean Sea off the coast of Columbia and mostly 10-15% over the Gulf of Mexico. 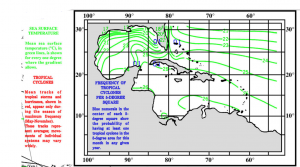 Over the eastern Caribbean winds and seas tend to be lighter and the risk for encountering rough seas is 10% or less. Air temperatures during February average 25 to 26 C ( 77 to 79 F) across the Caribbean, 15C-22C (59 to 72 F) over the northern and western Gulf of Mexico and 22 to 25C (72 to 77 F) across the Bay of Campeche and southern Gulf of Mexico. Sea surface temperatures range from 25C-26C (F) in the Caribbean,17-22C ( F) over the northern and western Gulf of Mexico and 22-25C (F) in the Bay of Campeche and southeastern Gulf of Mexico. 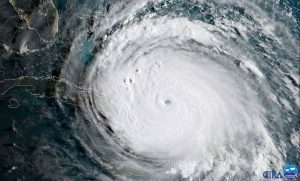 Gulf of Mexico and Caribbean mean ocean temperatures and risk of tropical cyclones. Tropical cyclones are rare in February with only a 1% risk confined to the Yucatan Channel, southeastern Gulf of Mexico, Florida Straits and northern Bahamas. Get custom cruise forecasts here. An outlook is issued to indicate that a hazardous weather or hydrologic event may occur over the next several days. A watch is issued whenever that risk has increased significantly but the occurrence, location or timing are still uncertain. 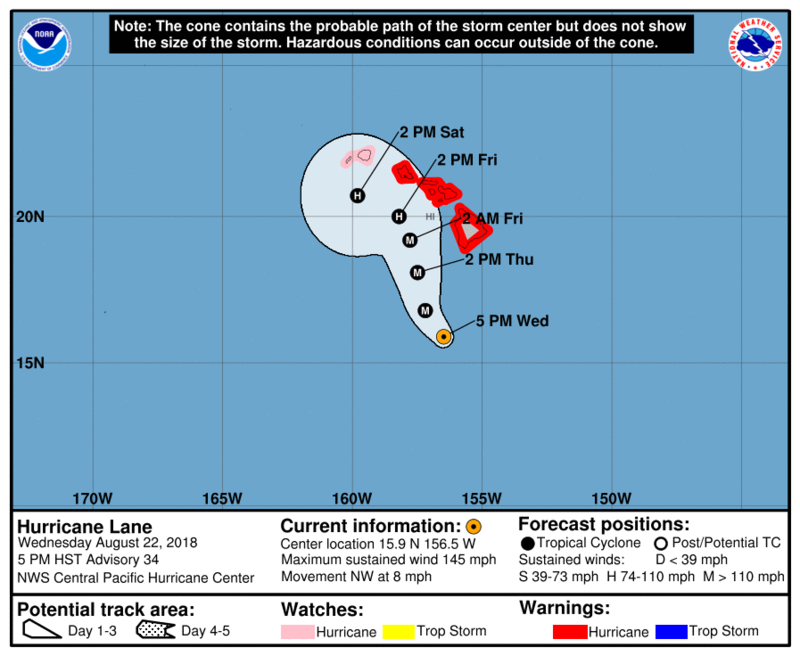 Marine Watches for “GALE” “STORM”, and “HURRICANE FORCE” wind conditions, not related to tropical cyclones, can be highlighted in extended range forecasts beyond 24-hours for coastal inland waters, and offshore waters (does not include high seas forecasts). 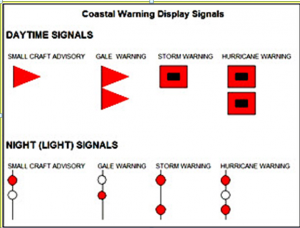 A warning is issued when the hazardous condition or event is either occurring, imminent or likely (for the marine forecasts, within 24-hours). A weather advisory is issued when a hazardous weather condition or event is occurring, imminent or likely but for less serious conditions than those that would warrant a warning. A Gale Warning is issued when sustained surface winds (averaged over a ten minute period, momentary gusts may be higher) of 34 knots (39 mph) to 47 knots (54 mph) are either occurring, imminent or likely (for the marine forecasts, within 24-hours). 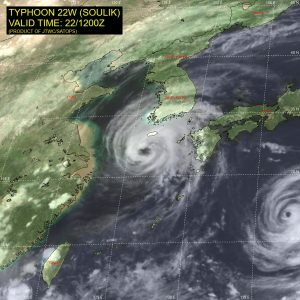 “Developing Gale” refers to an extratropical low or an area in which gale force winds of 34 knots (39 mph) to 47 knots (54 mph) are “expected” by a certain time period. 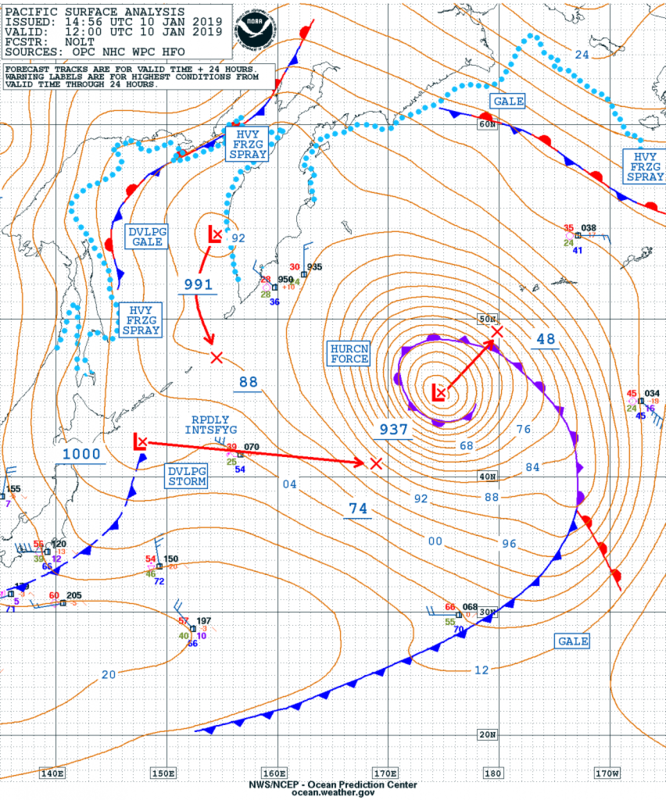 On surface analysis charts, a “DEVELOPING GALE” label indicates gale force winds within the next 24 hours. When the label is used on the 48 hour surface forecast and 96 hour surface forecast charts, gale force winds are expected to develop by 72 hours and 120 hours, respectively. Major Hurricane Florence currently with max winds about 120 knots was moving west at 11 knots. A building ridge to the north is forecast to steer Florence WNW then NW during the next 48-72 hours with an increase in forward speed. Conditions remain favorable for deepening with max intensity possibly reaching 130-140 knots. Increasing wind shear forecast in about 72 hours may weaken the max winds just prior to landfall late Thursday night along the coast of North Carolina. Major Hurricane Florence continues to develop with max winds now at 115 knots (Cat 4). 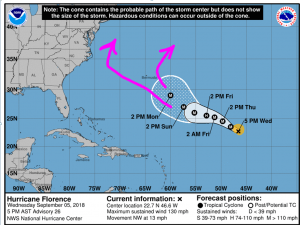 Florence is moving in an area where wind shear is forecast to increase during the next 48 hours so Florence is expected to weaken somewhat but could again intensify thereafter. Florence is moving towards the northwest at about 11 knots but a strengthening ridge to the north should cause a more westward track for a while. 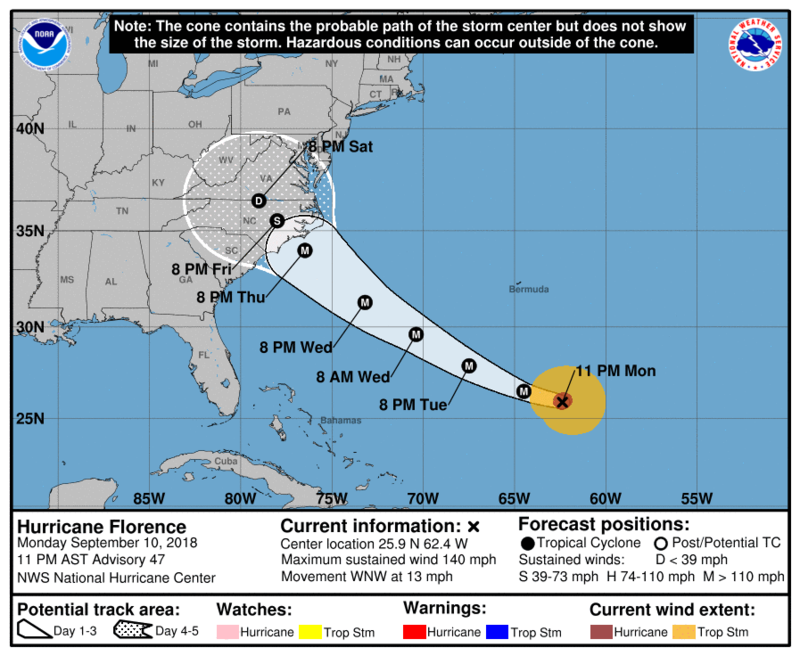 Thereafter, the track becomes uncertain with some models turning Florence northwest the north while others suggest Florence could move close to the US East Coast before turning. If this happens, areas from the Carolinas to New England could be affected next Wednesday through Friday. Typhoon Cimaron over the western North Pacific was located about 245 nm WMW of Iwo To and was moving northwest at 19 knots. Currently, max winds are estimated at about 100 knots with the hurricane force winds concentrated north and east of the center. 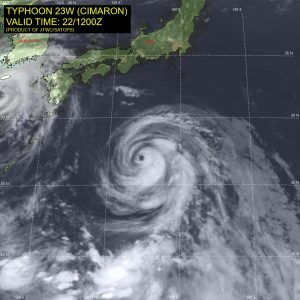 Cimaron has already reached its peak intensity and is forecast to gradually weaken making landfall over eastern Shikoku at about 12:00 UTC on the 23rd with max winds near 80 knots, then move northward across Honshu into the Sea of Japan.